1 of 4 Heat oven to 375 degrees F. In a mini chopper or food processor, pulse almonds until finely ground. Add 3 tablespoons of the butter. Pulse until combined and fairly smooth. 2 of 4 In a medium bowl, combine flour, baking soda and salt. In a large bowl, beat the almond mixture and remaining 1/2 cup butter with an electric mixer. Add 1 cup of the sugar and beat until smooth. Add egg and vanilla and mix well. On low, beat in flour mixture. 3 of 4 Form a heaping teaspoon of dough into a ball. Roll the ball in the remaining 1/4 cup sugar and place on an ungreased baking sheet. Repeat with remaining dough and sugar. 4 of 4 Bake cookies at 375 degrees F for 12 minutes. 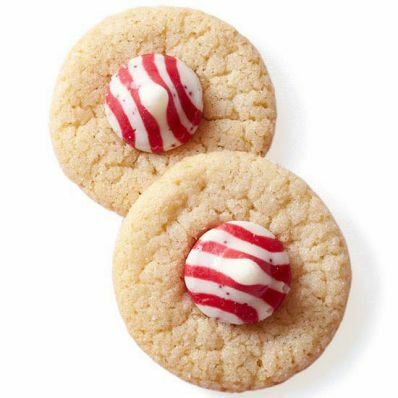 Remove from oven; press a candy kiss into the center of each cookie. Cool 2 minutes on pans, then transfer to a rack to cool completely.